One morning I woke up and my entire Smart Content tab in DAZ Studio was empty. Nothing had happened since the day before when it was working perfectly fine. It just stopped working overnight. What I had done shortly before going to bed was to install the latest service release of Poser Game Dev (SR5). If this was the cause of the problem or not will forever remain a mystery. In this article I’ll explain how I fixed this issue on my Mac. Content Management Services you say? DAZ now offer two types of metadata management. They both rely on a database server to run which can manage which content belongs to which figure, what type of content an item is, and so forth. Those are background services, also known as daemons: little always-on apps on your system. For many years this was Valentia DB, but as the demands for more metadata has risen over the years, users have on and off experienced problems with database corruption – which is why DAZ Studio 4.6 now supports PostgreSQL. Now DAZ Studio users can choose to use a different database server for their metadata if they wish, or stick with Valentia DB. CAVEAT: If you’re using Carrara 8.5 then PostgreSQL is not going to work because Carrara does not currently support it. 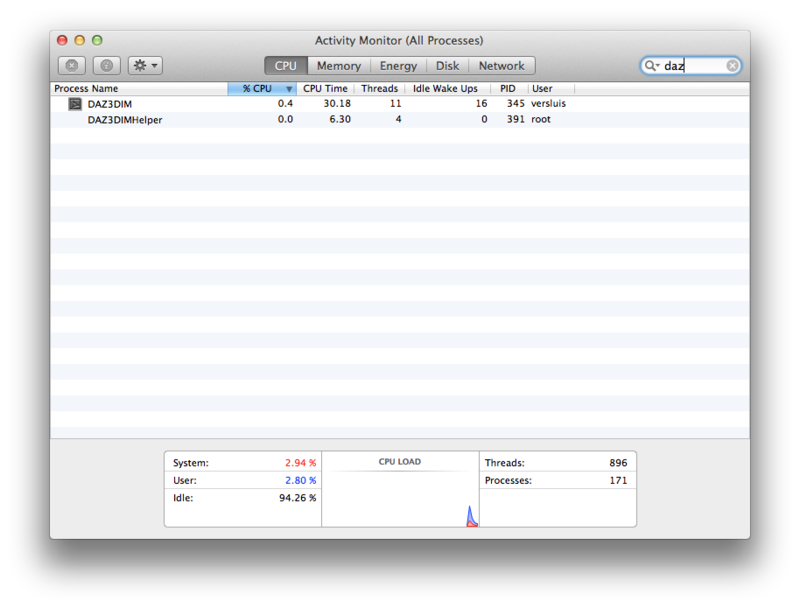 Hence, I’m sticking with Valentia DB for now – and it looks like that’s what I have a problem with on my Mac. 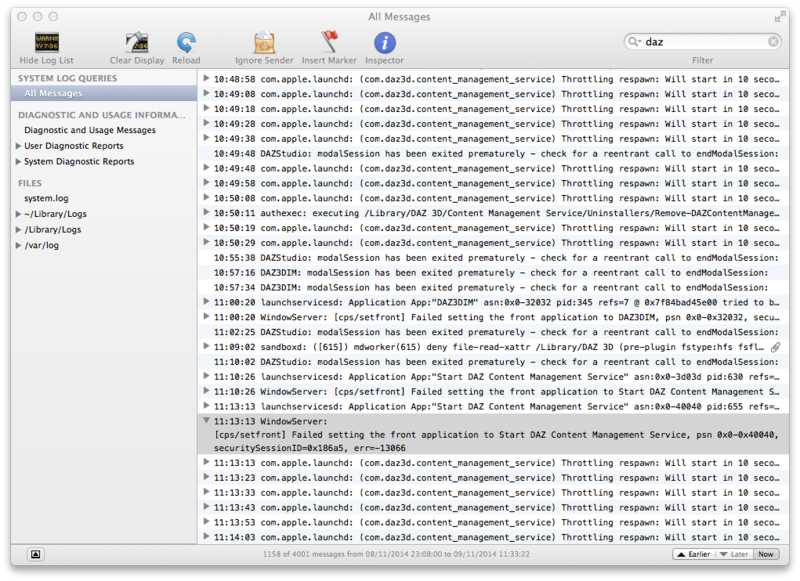 A few hours of research revealed that the DAZ Content Management Server (Valentia DB) was not running on my Mac. I never had a problem with it until today. To check if the service is up, head over to Applications – Utilities – Activity Monitor. This will bring up a nice GUI akin to the command line tool top and allows you to see everything that’s running on your Mac right now. To narrow it down, type “daz” into the top right search box. On Windows there’s a similar tool called the Task Manager – it’s probably easiest to search for it rather than figure out where they’ve hidden it in Windows 8.1 Check out this link for details. If a service isn’t running, it’s probably best to start it and see if this fixes our problem. Both will prompt for your admin password. If all goes well, the service should start and it should show itself in the Activity Monitor – and of course that Smart Content Tab in DAZ Studio should now be populated as it was yesterday. Naturally this wasn’t the case for me: the service simply didn’t want to start anymore. Poor thing. Perhaps he was sick and tired of serving content, or something else was preventing it from doing so. Every system admin knows that if things fail, it’s best to check the error logs to see why and how something has failed. I always forget that this is less painful than it sounds. According to this it appears that the service is trying to start, but isn’t allowed anymore. God only knows why, because it sure as hell was less than 12 hours ago. Are the Poser people trying to jeopardise DAZ Studio users? Or were my 3D characters not happy with the morphs I keep drawing onto their faces? Was it Revenge of the Runtime? How can we fix this, Cap’m? This approach works – but because the DAZ Installation Manager (DIM) gets involved it may not work as expected. I had installed DAZ Studio 4.6 via DIM, so I uninstalled it via DIM too. But re-installing it via DIM does not re-install the Content Management Service – it’s only installed when the manual installer is used (they don’t tell you this in the tourist brochure). Make sure to point to your existing DAZ 3D Library during the installation. When it’s finished, launch DAZ Studio and notice that your Smart Content pane is still empty. Find that little disclosure triangle and select Content DB Maintenance. This will present you with a modal window. Select Re-Import Metadata and you’ll see a list of all your products in the associated directories. All should be selected by default, so click Accept and grab a coffee. After a while you’ll have your Smart Content pane repopulated. Thank you for instructions that are straightforward yet detailed enough to get the job done. I am running DS 4.7.12 on a Mac 10.7.5. I believe I have all of my files correctly deployed, but I am not getting Gen 2 Male Base coming up in Smart Content. I have looked, at the DSX files (pretty closely, I thought,) and it seems all files are where they need to be. I have reloaded Metadata several times. The G2Male Base is in Content Library, just not Smart Library. Gripes me. Hope you can help . . .
that’s a tricky one. I’m on a Mac too and Genesis 2 Male shows up in Smart Content. Does Genesis 2 Female show up in your Smart Content tab, or other content? I would probably uninstall the Genesis 2 Male Starter Essentials and then re-install it via the Install Manager. Good luck! I found the problem after I went through the G2M Base Essentials DSX files to confirm all the paths. I set up Daz to load G2F Base at start up. So in the Files/Products Editor, guess what would I see? Female material only. I would not see any Male stuff. When I deleted the G2F figure, I would see G2M in the DAZ Figures folder. Duh . . . . I hope I can pick your brain in the future about actual operating info . . .
Ah yes, one of the more annoying habits of Smart Content. Glad you worked it out! I think I have seen link for the manual, but I appreciate the remark that not much has changed from 4.6 to 4.7. I couldn’t find anyone to tell me that! Candidly, I am not a big fan of manuals, for any software. They show the functions, but usually miss explaining what I want to do, if that makes sense. The biggest change I can remember in 4.7 was the addition of an aux viewport. This lets you preview a render in a small window without having to wait for the “real” render. It’s good to get an impression of overall lighting. You can access it via Window – Aux Viewport. 4.8 will introduce a new default render engine (NVIDIA Iray instead of 3Delight). That change will be more dramatic as lights and materials will start to behave very differently – plus render times will increase by 500% or more. Hey, Jay. I’ve been encountering a somewhat related problem with DS 4.9 and OSX 10.12. I wrote to Daz support about it, and while I was waiting to hear back from them, I figured out what was going wrong. None of their fixes were even slightly practicable for me (delete and reinstall? Such a typically Windows answer), so I didn’t try them. Here’s what was happening, and why. I have DS installed on two Macs, a portable (for composing) and a desktop (for rendering). The desktop Mac has all the Daz content — models, materials, user files, everything. I connect to it via network with the portable. Here’s what was going wrong. The logfile on the portable Mac indicated that the CMS could not connect to the remote volume’s content; it was throwing a ‘permission denied’ error. The trouble is that it doesn’t do that consistently. It only happens sometimes with the remote volume, and never happens at all with the desktop (which has the files resident on its hard drive; it’s not remotely connecting at all). This appears to actually be a fault in OSX and the way it behaves with network volumes; or actually, the way it misbehaves. It’s also relatively novel; the problem began surfacing only after I installed 10.12.x, but didn’t happen with 10.11.x or anything previous. It mounts on the desktop with the name ‘Harddisk’, as you’d expect. …and mounts on the desktop as ‘foldername’. So far, so good, right? …and under normal circumstances, it is. The CMS has no trouble locating any of the remote content, reading it, working with it, etc. …And when you look at it in Terminal, you see its permissions are set so access to it is blocked. The other way it’s a problem is that the next time you mount the remote volume, Finder tries to behave as though there are no problems. It still mounts the item to the desktop as ‘foldername’, and it still displays in /Volumes as ‘foldername’. But the *actual* name is different; its path is given as ‘foldername-1’. OSX hides this rather important fact from you. …But one of those foldername items is marked as unreadable. In icon view, it shows as a folder with a red circle and line over it, indicating your access is locked out. The other foldername item is actually called foldername-1, but there is no way to know that short of actually traversing the path in an open-file dialog and reading the results; or by cd’ing in through Terminal and doing a pwd to find out what the path actually is. The solution is to unmount the remote volume, navigate to the /Volumes directory, and force Finder to delete the locked ‘foldername’ icon. After that, remounting ‘foldername’ before loading Daz allows the CMS to connect properly to its contents. Quite welcome. I thought it was worth retaining *somewhere*, and this seemed a pretty good place for it. I think I’ve narrowed it further. The portable uses a remote disk for Time Machine, and whenever TM fires up to run a backup, it silently creates a temp volume called [username] in /Volumes to do it. So if your Daz content is located on another remote volume, and you connect via the standard way through file sharing, and you’re using the same username there as well, it means your Daz content is going to be loading from a networked folder also called [username]. TM does its mojo once an hour. If it’s quietly backing up to [username] at the same time you try to mount the other [username], you bet there’s gonna be a pathname conflict. Rather than deal with that, Finder calls the second mount point [username-1] … and doesn’t bother to tell you. Daz doesn’t seem to like that. So if I weren’t using TM to do a remote-disk backup, I’d probably never, ever see this problem at all. Thanks for writing this. I’m on Windows, but this was close enough to save me a lot of time. I’m new to DAZ Studio, and it would have taken me forever to figure all that out on my own, so I really appreciate it. So pleased to hear this worked for you, Melissa!